Well, how's everyone's week going so far? We made it through another Monday, right? So being that it's Tuesday, let's change the subject to TCP Tuesday from The Cat's Pajamas! (Who wants to talk about crummy Mondays anyway when there's so much fun to be had on Tuesdays?) This week's Hostess with the Mostess is Amy Rohl, the queen of quirk, I mean cork! Cork is fastly becoming the latest trend, and as always, trendy Amy is all over it. Amy has challenged us to "get corked" by using cork on our cards and projects. 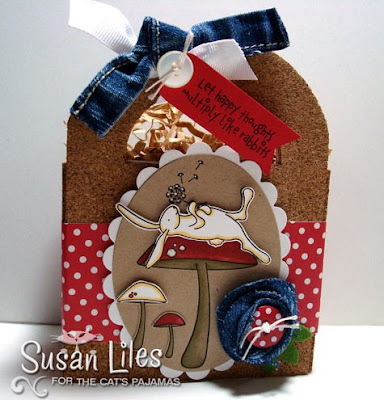 Since I was starting to feel "estranged" from my crafting space, I decided I wanted to make a little bit more of a time-consuming project and get comfy in my crafty chair to bask in a little more crafty goodness than just making a card. I knew right away that I wanted to cover one of these little $1 unfinished wood boxes from Michael's with cork sheets (that I also found at Michael's). So I painted only what would show on the box white and traced, cut out and adhered the cork to the rest of the box. The band was placed around it and the image panel is popped up a bit, with the bunny and white mushroom cut out and popped up even more for some 3D action. 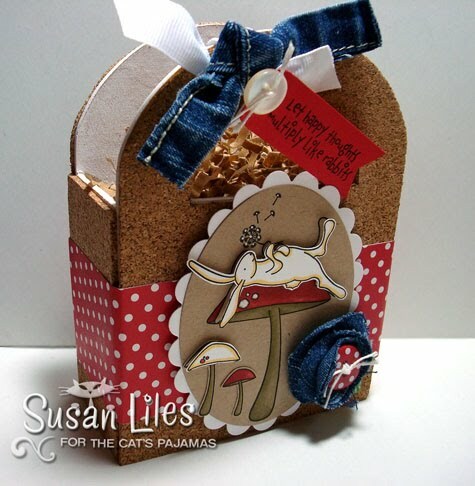 Rising just as fast in popularity as the cork is fabric and denim in conjuction with papercrafting and scrapbooking projects. So yes, I HAD to go there, too. Audrie approved of me cutting up some of her old jeans that no longer fit and making this cute little flower and using some of the hem to make the tie on the little handle there. There's lots of ways to make these flowers. I saw some in magazines and on YouTube, but basically ended up doing my own thing with them and I think it turned out pretty cute! I'm sure (i.e. I KNOW) you'll be seeing more cork and denim in some of my projects to come. Let's get corked AND frayed!! Yes! SUSIE Q-TIP: When trying to come up with a plan as to how I was going to stick the cork onto the wood box, spray adhesive was recommended to me. I've never used it. Come to find out, it's really really REALLY sticky. Let's just say it got all over my hands and I was able to "tack and peel" more of Eric's hair right out of the top of his head with my sticky hands just like a lint remover. ROFL!! I could not get the stuff off without googling what to do about it. They (whoever they are) suggested olive oil. I'm out right now, so I decided that suntan oil would have to work. It did. Now lets just hope the palms of my hands don't get that golden Coppertone glow. You are just hilarious!!!! I love your sense of humor even in the face of such difficulties - you are an inspiration to us all with your cards AND your positive attitude. 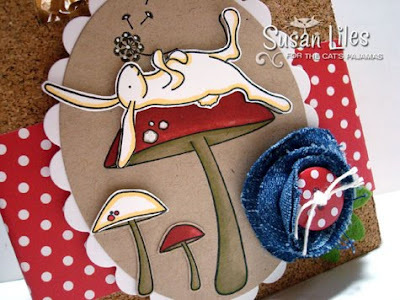 Love the cute bunny and what imaginative use of cork - I have never used cork in any of my projects, maybe I should try! Absolutely fabulous. You ROCK my world! ooooh! cork + denim + red polka dot = awesome!!! you just crack me up. if you had used the olive oil I'll bet you would have been tossing salads to get the excess oil off your hands. it's a great box. I'm loving cork. I have some great glue that I've been using with the cork. I think it's Beacon 3 in 1 or something like that. There's more than one Beacon so I gotta go dig up the bottle and if it's something different I'll leave another post. OMG... this is fabulous!! All the details are perfect as always! !